You will never be left alone here in Thailand. Denta-Joy has teamed up with some of the finest accommodations and hotels in the area to offer the most attractive room rates and services. Send us an email now and be assisted from your place up to your own doorsteps in Bangkok. Your selection of hotels and accommodations can be found below. 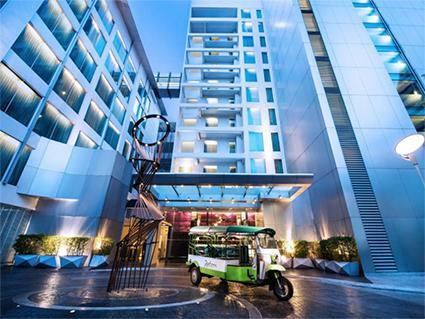 Salil Hotel Sukhumvit 57 is the newest addition to Salil chain of hotels. A “Concept Living Space” as how they boast it, get ready to experience a stylish, yet luxurious hotel culture in Bangkok showcasing very sophisticated and unique room set-ups at a very affordable rate. You will surely enjoy the place’s coziness for the rest of your stay. Suitable for short and long term stay, Salil Hotel living suites is at 28, 35 and 40 sqm. Be pampered by the complete room amenities and toiletries sponsored by ELLE. Salil Hotel Sukhumvit 57 is less than 500 meters away from Denta-Joy. Salil Hotel Sukhumvit – Soi Thonglor 1 is a 4-star boutique hotel located in Sukhumvit Soi 55, 5 minutes away from Denta-Joy by feet. Salil Hotel is your place-to-be if you are looking for a colorful atmosphere with 3 buildings each themed differently to match your mood of the day: Spanish style and Barcelona-themed for a vintage feel and Pastel and Chic, attractive to younger guests. The 25 sqm Superior rooms and 35 sqm Deluxe rooms are fully furnished and equipped with amenities. Mövenpick 5-star apartment located at Sukhumvit 63 (Ekkamai) is the perfect choice if you prefer a more private and relax accommodation during your stay. Brought to you by Mövenpick Hotels and Resorts, expect superior service and wide-range amenities for a very comfortable day of rest. Room sizes start from 31sqm to 87 sqm. Patients can use the free shuttle-van at the hotel and drop-off at Denta-Joy and expect to arrive in less than 10 minutes. Timetable for the shuttle van will be assisted to you by the hotel desk or our patient coordinators.